Well, today is September 30th. It is amazing to me how quickly this year has gone by. I swear it was the beginning of summer yesterday… Well this day is always melancholy for me. My mother passed 6 years ago today. I miss her very much. She was such an inspiration and I have to credit her for the best parts of who I am today. It is also because of her that I love all the various things that I do. On to other things… I learned last week that I have been picked to receive the book lovers cravebox. I can’t wait. It should arrive this week. I will let you know what I think after I read the book. They were giving away hints on twitter, so I think I know what the book is and I have a feeling I am going to like it. They also send a long a few other products to enjoy while reading the book. All the products they send are new to the market, so I will get to be one of the first to test them. If this kind of thing interests you, you should look into it. As always I have been busy cooking and trying many of the new recipes I find on pinterest. I love that site, if you don’t belong, you should. 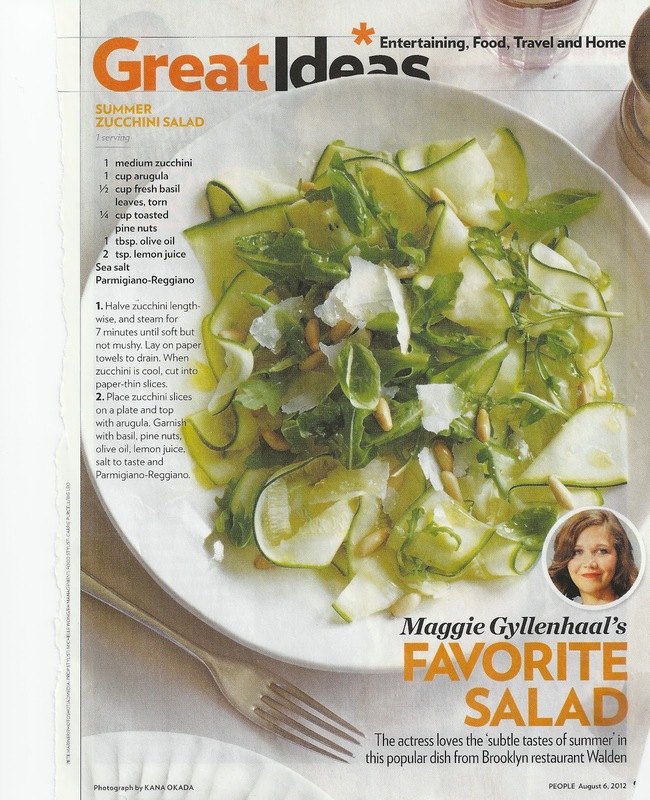 I also like to try the recipes that I find in People Magazine. Yes I said People magazine. I tried this recipe by Maggie Gyllenhaal. It was delicious. 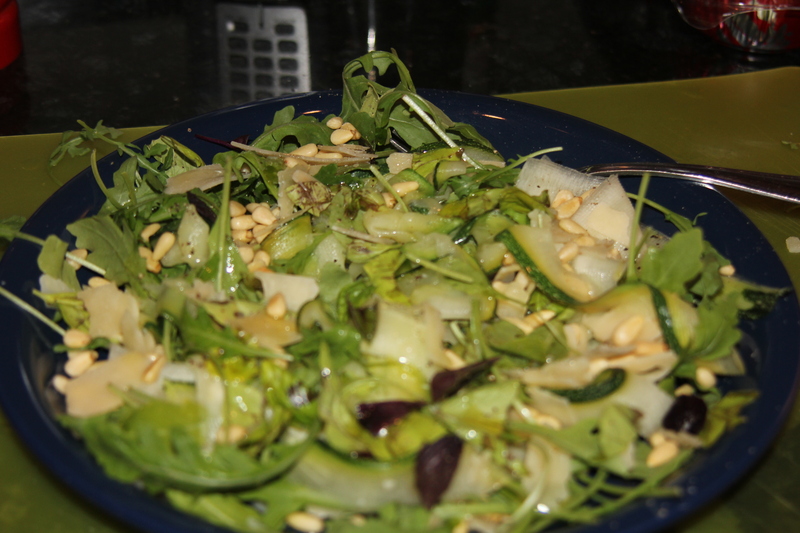 It was made with arugula, ribbons of zucchini, pine nuts, parmesan cheese and an oil & lemon vinaigrette. I can’t seem to find the recipe online – but here is a scanned version. Mine doesn’t look quite the same, but be assured, it tasted delicious. Try it while you can still get fresh local zucchini. I think I will spend the rest of this rainy day working on a few craft projects and watching football. Happy end of September. This entry was posted in Food, Interests, Pinterest, Recipes and tagged cravebox, Pinterest, recipes.